Naturally, this situation had an impact on the used car market as well. If you’ve ever wondered why the picture of my granddad’s used car lot in the header of this blog only has four cars, you need to put it in context. That picture was taken right in that time period of 1942-1944 or so, and the fact that he even had four cars was significant. The actual Hover Motor Company car lots were in business from the 1930s through the 1970s in various locations in Colorado Springs. You’d think there would be a bunch of lot pictures with that big of a time frame, but nope, this is the only one. So, we’ll make the most of this picture. If you’re at all curious about the four cars that were sitting there that day, read on. We’ll analyze the inventory a bit from left-to-right. When you travel around to car shows these days, ’39 Pontiacs aren’t all that common. Out of the four cars in the picture, this one is easily the rarest, with a total of 144,340 Pontiacs built that year. Sales were up significantly from the year before, however, likely due to a couple of new models that were built with mildly altered Chevrolet bodies and platforms. The little coupe in our picture would be pretty similar to a Chevy if you lined them up together. This car was powered by either a 223-c.i. six cylinder that screamed out a whopping 85-hp, or a 100-hp, 249-c.i. straight eight. Maybe that’s why if you do encounter a ’39 Pontiac today, it will more than likely have been converted into a hot rod. When brand new, the best ’39 Pontiac could be had for under a grand, but here recently, a special example has been in the headlines. A 1939 Pontiac sedan with a clear Plexiglass body sold earlier this year for $308,000 at an RM Auction in Michigan. It was used in General Motors’ famed Parade of Progress displays to show the inner workings of the latest Pontiac. In contrast, my granddad’s Tin Indian sold for much less. According to the National Market Reports Blue Book from 1942, the average cash value of a ’39 Pontiac Coupe was only $366. 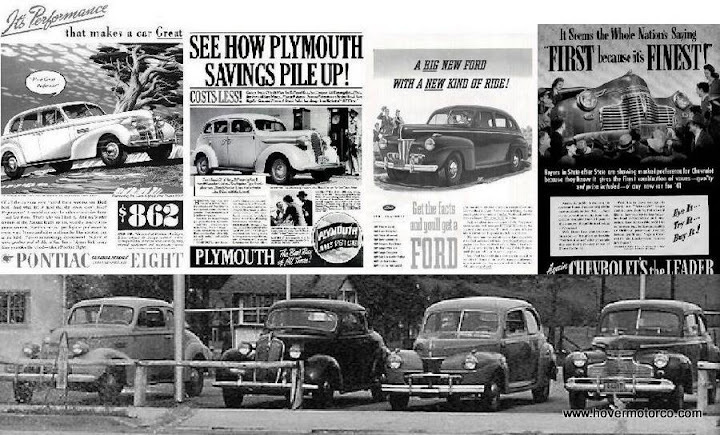 Plymouth has been gone from the U.S. market for many years, but in 1937, it was a force to be reckoned with. That year, the number three brand sold a staggering 566,128 cars, putting it behind Chevrolet and Ford in the pecking order. Granddad’s Business Coupe had a $580 price tag fully delivered when it was new, but by 1942, the National Market Report Blue Book gave it a cash value of only $183. You couldn’t even pay the yearly taxes on a five-year-old car for under $200 today. 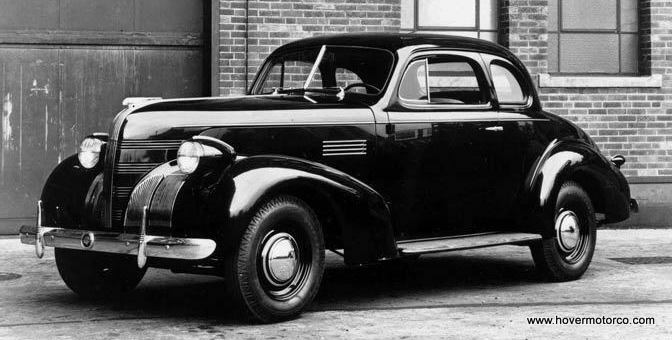 A '37 Plymouth would have been motivated by an 82-hp, 201-c.i six-cylinder. The Business Coupe weighed in at 2,771-lbs. Everyone thinks old cars were so heavy because they were full of steel and pot metal, but compare that weight to a 2011 Corvette coupe that tips the scales at 3,214-lbs. Electronics, emissions, and safety devices add a lot of beef. One interesting version of the ’37 Plymouth Business Coupe was the “P3” option package, which offered less luxury touches than a normal car, but a small pickup bed inserted where the trunk lid would go. That rare option is reminiscent of later car/truck combos like the El Camino and Ranchero. I have to admit, if I had to choose one of these cars to keep for myself right now, this one would probably be it. I think ‘40s are way better looking, and the ‘42s are also somewhat better looking, but these ‘41s aren’t too shabby either. This two-door sedan body style is one of the greats in automotive history. By the way, I realize that that's a Fordor in the sample pic to the left. 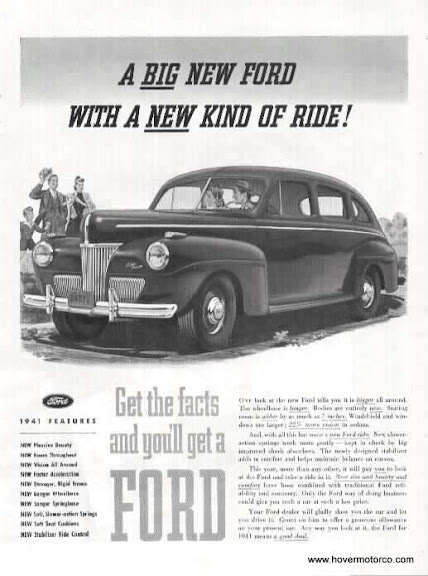 In 1941, Ford sold 691,455 cars. That’s a lot of metal, but ’41 was a big year. These were all new and thoroughly modern vehicles, with a much wider body and the elimination of the running boards. Ford took a major step in the evolution of their styling that year. Engine options for a ’41 Ford included a 90-h.p., 226-c.i. six-cylinder, or the vaunted 221-c.i. Ford flathead V8. Interestingly enough, the V8 was listed with five less horsepower than the six, down to 85. 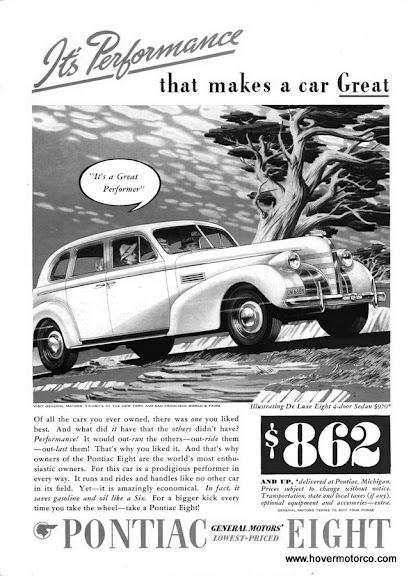 A DeLuxe Sedan like the one on the lot had a base, delivered price of $756 when it was new. National Market Reports said in 1942 that it would have a cash value of $505, but the retail value was $758. One thing my granddad was known for was his ability to buy late model used cars cheap, so I’m sure there was money to be made on this year-old Ford. Unlike Ford, archrival Chevrolet only offered one engine choice in 1941, the venerable Stovebolt Six, rated at 216.5-c.i. and 90-h.p. That proved to be one excellent engine design, as similar versions were still being installed in Chevys well into the 1980s. 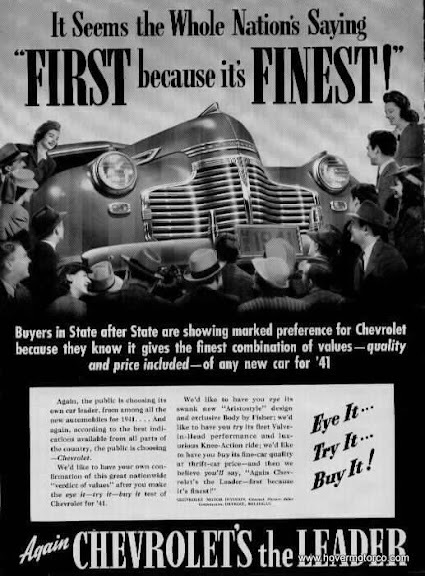 Chevrolet was far-and-away the biggest seller in 1941, with 1,008,976 cars moving out the door. So you don’t have to do the math, that means the Bowtie Brigade sold 317,521 more cars than the Blue Oval camp that year. Modern, rock-solid cars backed by the formidable power of General Motors was a hard combination for anyone to overcome back then. As an aside, here’s another statistic. In 2010, GM’s three core car brands (Chevrolet, Cadillac, and Buick) sold 804,511 cars. That means that in 1941, Chevrolet alone sold 204,465 more cars in North America than all of General Motors combined in 2010. I just thought that was interesting. 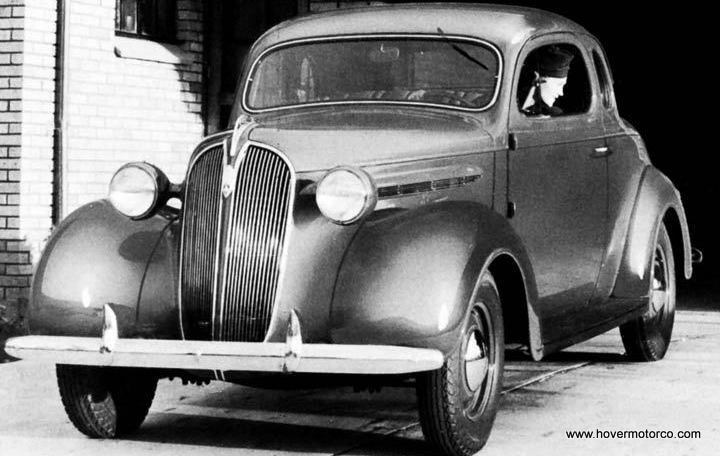 Similar to Ford, Chevrolets had an all new design in ’41, with more room than ever before, a wider body, and the elimination of the old-fashioned running boards. Judging by the picture, I think my granddad’s Chevy was a Master Deluxe Coupe. A car like that would have started at $743/delivered when new. By 1942, the retail value had increased to $780 according to the National Market Reports guidebook of the day. I’d buy every ’41 Chevy I could get my hands on for that kind of money today. At any rate, if you’ve ever wondered about the four cars in that picture up there, or even if you haven’t, now you at least kind of know what they are. I don’t have a huge slideshow full of these four cars to present to you, and I’m not sure how much you’d care to see it anyway. So instead, I’m running the Hover family photo album slideshow. I know it’s a rerun, but it took me forever to make it, and it sort of goes with the theme because this whole story is about a car-related family photo. Captions are available if you click the bubble. Thanks for checking in! 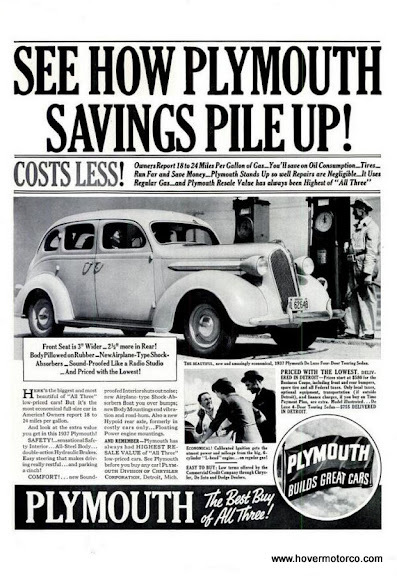 Speaking of 37 Plymouth's, My first car (was really my third but the first one that I actually drove when I turned 16 in 1953) was a 1937 Plymouth 4 door that I paid $12.50 for. It had a tooth off of first gear so I put a used transmission in it from my second car (before drivers license), a 38 Plymouth 2 door that had been rear ended. I traded a pocket watch for my first car (before drivers license), a 1936 dodge 4 door which I traded for the 38 Plymouth. Yeah, I DID wonder about the story behind those rides in your headliner. A fellow even older than me (heh heh) told me at an event a while back that in 1953, the new Ford OHV six would out accelerate the old flathead V-8. He said the company didn't want that embarrassing fact to be admitted. Craig, just FYI... I sent this link to several friends, including one in New Zealand and one in England - they LOVED the slideshow too! Really a great glimpse into an American car guy's family. Thanx again. And... this for historical purposes only... that's a '58 Mercury, not a '57. I only sheepishly mention this because it is the first time I can actually document any error in Craig's assessment of any vehicle, ever!